The November 2018 release of CoreRelate applications (MatterLink, Docket Enterprise, Assemble-It and LegalBar) is now available. Visit the download page to access the package and detailed release notes (both monthly and cumulative.) Valid login credentials are required. This release brings enhanced functionality to two popular features of the CoreRelate suite, the MatterLink – Docket pane in Outlook and LegalBar File Stamp. The pane can now be enabled/disabled from a new toggle button on the Outlook ribbon’s CoreRelate tab. The pane now includes Tasks as well as Activities. A paperclip icon next to an activity or task denotes a document link and right click provides access to the linked document or website. It is now possible to update the status of activities and tasks from the pane. There’s more…read more details in release note # 11863. If you are tired of Word’s Compatibility mode and the conversion process, you will like this feature! The File Stamp can be configured to automatically up-convert a .docx document that was created in an older version of Word as it is opened. File Stamp also now includes a Suppress Stamp feature. This can be used in a specific document (or template) to exempt the document (or documents based on the template) from your automatic stamping configuration. It also prevents insert of a manual stamp. 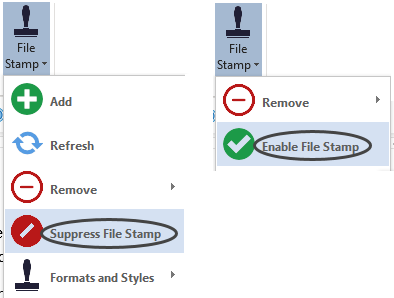 The suppress (and re-enable to remove the suppress) are available from the Word ribbon Insert tab, on the File Stamp drop-down. Couldn’t be easier.